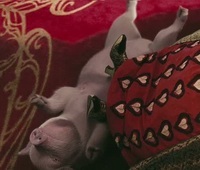 The Red Queen's pig . . Images in the Alice in Wonderland (2010) club tagged: the red queen's big i need a pig here alice in wonderland tim burton tim burton's alice in wonderland icons.